A number of people have emailed me requesting information on the cost of living here in Nicaragua. At long last, here it is. Please note that this is based solely on my experience here, with my husband. Each traveler will have a different set of needs and therefore, a different budget. I would also note that if you are seriously considering a move here, it is helpful to have a minimum of a few months of living expenses already saved, as well as money set aside for a trip back home, if necessary. Do not operate under the assumption that you will be gainfully employed here, as Nicaragua currently has an unemployment rate of 3.9% and an underemployment rate of 46.5%. 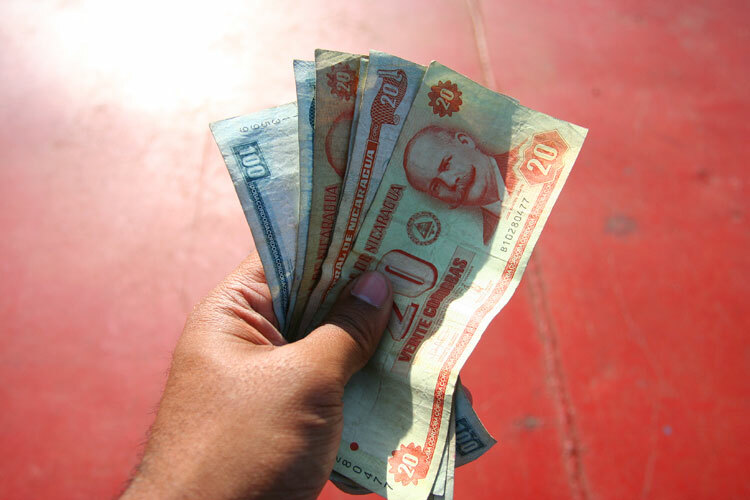 The exchange rate is approximately 20 Nicaraguan Cordobas to the US Dollar. This number varies greatly depending on where, within Nicaragua, you decide to live. San Juan and other more touristy areas tend to cost more. San Juan, 1-2 bedrooms: anywhere from $250-$600/month. We are currently living in a furnished 1-bedroom for appx. $500/month, but it includes water, electric (plus back-up), security, housekeeping 2x/week, Internet, and cable TV. This cost also depends heavily on where you live. If you have an apartment that draws from the town water supply, you are likely to spend approximately $10. If you live in a development, outside of town, you might have significantly higher water bills, especially if you have a pool. A basic monthly electric bill will run you approximately $15 via Union Fenosa. However, if you have air conditioning and intend to use it, expect to pay a significantly higher monthly bill. Most homes have propane-powered stoves/ovens. They typically come with a gas tank that you refill as needed. A small tank costs approximately $15 to fill and will last you a few months. Cheap, burner phones can be purchase in town starting at approximately $20. Minutes can be purchased as needed. There are 2 phone companies here – Claro and Movistar. People claim that Claro has better coverage, but most people I know have Movistar. It’s helpful to know that calling between the two companies (i.e. Movistar to Claro) is almost as expensive, if not more expensive, than calling back home to the States. But, calling within your company (i.e. Movistar to Movistar) costs very little. So, if you already have friends here, find out what they have and consider getting that. You have 3 options for television (cable via Estesa, satellite TV via SKY or pirated satellite tv). Cable runs about $18/month, SKY begins around $32/month and pirated is free once you buy the dish and the box. In order to have internet, you need to have a cable connection, via Estesa. Internet costs anywhere from $30 – $50/month depending on your connection speed. Cost of fuel is hovering around 15-16 cordobas/liter for diesel. We can fill our tank (a Trooper) for about USD$50. Regular gas is slightly cheaper. Premium gas is slightly more. If you plan to own a car, don’t forget to figure in the cost of minor repairs, as well. We take our car to the mechanic on a monthly basis down here. We haven’t had any major problems, but maintenance takes on an entirely new meaning when you are driving on unpaved roads. Imported items, such as granola bars, JIF peanut butter, will cost more. There is a Pali grocery store, here in San Juan del Sur. You can also purchase many of your food needs at a local pulperia. La Colonia and La Union are larger grocery stores, located in Granada, Managua, and other larger towns. As for entertainment, during the day, you can rent a surfboard ($10), an ATV ($20), take a canopy tour ($30), or hike to the lighthouse or Jesus, swim, bike ride, hit the beach, etc. for free. You can also take Spanish classes, which range in price depending on the number of hours you want to study. At night, bars are usually free to get into. Beers are typically less than a buck. You can also order a media, which consists of a half-liter of rum, a bottle of coke, and a bottle of soda water, a bucket of ice, and some limes for under $10. A few places in town also have either a DJ or live music at night, including Coquito’s Bar. For dinner, you can treat yourself to one of the finer restaurants in town, like El Pozo, and spend C$220 on an awesome steak with sides (about $12). On the flipside, you can visit one of the fritangas (Chicken Lady) and get half a chicken, gallo pinto, salad, and tostones for C$80 (4 bucks) or the local market for a hearty $2 breakfast. And then there is everything in between including a great Mediterranean Restaurant (El Colibri) with awesome Sangria and stuffed chicken (for under 7 bucks), and Bambu (Nicaraguan cuisine with an Asian twist) which serves incredible pizza on Monday nights and panini sandwiches every day. My husband and I both have international health insurance through International Medical Group. It was on the more expensive side, but we purchased it prior to moving here, wanting to ensure that we had some coverage. We have yet to use it (knock on wood). Since moving here, we have learned of local companies that provide coverage – Seguros America, being one that I think is less expensive and provides tiered coverage. We have both had regular appointments with physicians at Vivian Pellas Hospital in Managua and were very pleased. The hospital was like any hospital I’ve visited in the States and the equipment was state of the art, including a lab and pharmacy. My entire appt., including consultation, lab work, etc. was about $50. I would steer clear of the Centro de Salud here in San Juan, unless absolutely necessary. However, there are local pharmacies here in town that employ doctors. If you have a run of the mill cold or rash, you can pay C$30 (less than 2 dollars) for a consult with the physician. I don’t know anything about dental insurance, but I do know that there are plenty of reliable dentists in Managua and that you can get a cleaning for about $25. When Justin and I first visited Nicaragua over 2 years ago, I ended up having an emergency root canal while in Leon. It was the exact procedure my husband ended up having 2 weeks later back in Boston, but mine cost $150, while his cost $1,000 after insurance! So, needless to say, we have been very pleased by both the quality and cost of medical care here so far. I hope those of you reading this find it helpful. Feel free to email me with any questions! This entry was posted in Living Here, Moving Here and tagged budget for Nicaragua, cost of living Nicaragua, health insurance Nicaragua, living in Nicaragua, moving to Nicaragua, San Juan del Sur Nicaragua by Sarah. Bookmark the permalink. I cant begin to express what an amazing job you’ve done detailing life in nicaragua, perhaps you’ve answered queries of anyone who’s considered visiting there or moving in there. I know its not an area that you may have researched on but how is schooling out there??? Hello there – I am glad you are enjoying my blog! San Juan del Sur is a wonderful place to live; however, if you are truly considering a move, with family, I might suggest visiting before making a final decision. Many people who visit never leave, as they fall in love with the town and can’t imagine life elsewhere. Others enjoy their stay, but can’t fathom living here long-term. Nicaragua is a very kid-friendly country – children are welcome just about everywhere. Given that something like half of the population is under the age of 18, it would have to be – right? As for schools, I did some preliminary research prior to moving here, as I am a school counselor by trade. There are a handful of private schools scattered across Managua and Granada (1.5-2 hours from San Juan). Families in San Juan rely on local schools, homeschooling, or 1 of 2 new daycares in town (for kids up to 5ish). If you have any additional questions, don’t hesitate to ask! We have enjoyed reading your blog and found the information helpful. We are considering Nicaragua as a possible retirement home. We will be coming in May to check it out but would like to have more information before we come. Are there any good websites for rental properties? Looking for something around $500.00, most sites only list expensive properties. Dear Steve & Terri – thanks for the inquiry and golad you are enjoying the blog! I have emailed you some information that you might find helpful regarding rentals and real estate. This is a great place to live! Just wondering if I could get that info in the rentals and real estate? I just stumbled onto your blog, I will be medically discharged from the military soon and I am also interested in moving to Nica. Kinda obvious though huh?!?!?! Contact Justin Fahey at Aurora Beachfront Realty: fahey.justin@gmail.com. I will email him with your contact info, as well. He can help you with rentals and real estate. You will love it down here! Thank you for taking the time to write this blog. Very helpful. Great stuff. The only thing I didnt see was the cost of buying a home perhaps near the water, or beach front property. But the entire article was fantastic. Glad that the blog has been helpful. I would be happy to put you in touch with a realtor if you are interested in property costs. All the best! THis blog has been bery informative, my grandparents are going now in January to look at a few house to retire in San Juan. We do speak spanish fluently so the language barrier won’t be an issue. But what they would like to know is how safe it is to live there not year round but leave the house unattended for some months. WE have done a lot of research on San juan and have also found that there are frequent power and waters outages? any information you can provide on these two subjects would be great. Your blog is very informative, probably the most I’ve come across! Thank you, its very helpful. We are contemplating the big move to Nicaragua, although we need to visit first, we think it may be just the place for us. We have 2 small children and obviously worry about all the normal things … schooling, medical and safety. Although, I’m not apposed to home schooling I would want our kids to have that social outlet and be a part of the community … do you know what the standards of the elementary schools are in SJDS? and daycares? Our kids are 3 years and 7 months. Are there decent clinics in town? Do you know what the hospitals are like? I’ve also been reading some unsettling info recently of violent crimes, kidnapping, robberies and such on the rise in Nica including San Juan, as a resident do you see this or is a glamorization of the facts? Sorry for the barrage of questions, its just that my husband and I have found so many conflicting articles and we’re finding ourselves quite confused. Any help you could give us would be very much appreciated! Thanks for your message! Glad to be of help to you in your planning! I can’t say much about the school system here having never experienced it first-hand. I can tell you that there are 2 private schools in San Juan that people seem to really like. One is called Explore English – located next to the town’s central park and church. I do not have many details on the school but check out their facebook page for more info. The second is a pre-school setting, on the beach, run by a teacher from the States. They don’t have a website, but I believe that you can reach them via their summer camp page. Ask for Julie – she’s fantastic! There is a nice community of parents with young children here in San Juan – both Nicaraguans and expats. Regarding clinics and health care – there is a Centro de Salud here in town. The majority of expats living here will tell you to avoid it like the plague. I haven’t personally experienced their services other than a medical check-up for work. However, I think that the center is making an effort with incredibly limited resources. Most people will suggest finding medical care at the private Metropolitano Hospital in Managua, about 2 hours north of San Juan. I’ve been and was very pleased with the services and found the rates quite reasonable. There are also hospitals in Rivas, about 20 minutes from San Juan. Again, I’ve never experienced this hospital so don’t have too much insight. In terms of the reports of violence, I think we all try to take that with a grain of salt. My husband and I have lived her for over 2 years now without incident (knock on wood). I think that Nicaragua has a bad reputation in international press and suffers because of it. You do need to use common sense, i.e. don’t take large wads of cash and passports to the beach, don’t walk alone at night in remote areas, etc., but given the proper precautions, you should feel reasonably safe. Some of the home robberies, albeit terribly upsetting, are targeted, as they often tend to be known business owners and therefore, robbers assume that they have a lot of cash on them. I wish those kinds of things didn’t happen at all, but we do live in a poor country that is also experiencing a drought. I would never condone such terrible behavior, but I do hope that we can eventually move in the direction of prevention – check out http://barrio-planta-project.blogspot.com for one such project. I hope that I was able to answer some of your questions. Feel free to send more as you think of them. Thanks for the info. I am thinking about retiring but wanted to get more info on rentals near the beach, can you help? Hi Glenn – check out http://www.vacationrentalsnicaragua.com for rental options! Good luck! Hey there! Thanks so much for all of your great information. I don’t suppose you can recommend online resources for finding a good place to live in the $500/month range? I notice that you’ve emailed resources to other commenters in the past and I’d love it if you could help me as well! Also, how’s the crime rate there? Do you feel safe most of the time? Thanks. Glad to be of help! For rentals, I would recommend contacting my husband, Justin, at http://www.vacationrentalsnicaragua.com. He should be able to help you find a place. You might also be able to find some listings on nicaliving.com. Wonderful! Thanks. I’ve sent him an email, and really appreciate your thoughts on safety. Have a fantastic day! I am considering coming to Nicaragua to research the possibility of starting a small boutique spa/resort with yoga and tai chi as well as a health oriented (seafood-range chicken-local ingrediants with vegan options) This is not to be a $$$$ endeavor but a small 12 to 20 cottages with (hopefully a connection to some local guides for nature hikes, wellness massage and instruction on yoga and Qui Gong Tai Chi. I am American and don’t know the laws as far as foriegn business ownership. Any books or websites you might suggest? Any opinions? I don’t want to go to an area with condos/timeshares/golf courses etc. Thanks so much for your message. When are you planning to visit Nicaragua? My husband has helped many people relocate to San Juan and to open businesses. I have been working in the hotel industry here for almost two years. We would both be more than happy to meet with you to answer some of your questions as there aren’t many resources out there for this kind of endeavor in Nicaragua. Thank You so much for writing your blog! I’ve been wrapped up in it for a while now. I’m very interested in moving down your way and was wondering so many things. hehe i do have a bit of a nest egg and all but will need a job 4 sure. whats the job market like for expats? i have lots of exp in a wide range of areas from construction h.v.a.c to hospitality. You might be able to find a job in hospitality on the notion that you speak English, but you would also need to know some Spanish. People are building here constantly, but you would likely be paid based on Nicaraguan wages unless you were a contractor. I would highly recommend a visit first to get a better sense of the area and opportunities and then take it from there. All the best to you in your adventures! I’ve really enjoyed your blog. My husband and I are looking at moving to SJDS in a couple of months, but are curious about the reliability of the internet and electricity; he is a web developer so it’s very important for him to have both of these. How often does the power and internet go out? Is it easy to find a place with a backup generator? Any advice would be greatly helpful. Also, we have two dogs we will be bringing with us. Do you know if it’s very difficult to find pet friendly housing? Thanks for your help! Thanks for your message! Infrastructure has come a long way since we moved here nearly five years ago. We do still experience power outages from time to time, but they are significantly less frequent now. We probably lose power, for a significant chunk of the day, 3-4 times per month. Sometimes, those are planned outages, so you can work around it. We also experience the occasional blip in power, which can reset the internet, but it usually returns immediately. There are certain times of year when the outages are more common, i.e. the beginning of the rainy season (mid-May-June) and during the major winds (Jan-Feb), as well as during the holiday season. Some rentals have backup power, others do not. Those who do have generators often only run it at night to conserve on gas during the day. But, you can almost always find a restaurant in town with backup and work from there. You have a lot more options for internet these days, too. I’d say most rentals will accept a pet, with a deposit of some kind. You might look into http://www.nicovale.com/ as a good option. They allow pets and have back up power at night. Best of luck to you! I see most posts are a few years old, how has pricing increased now in 2013? Are you inquiring about rentals or sales? I’ll be updating posts to reflect 2013 cost of living shortly. Check back soon!